Just a week out from election day and a new poll released by Rasmussen today has former Rep. Bob Beauprez up by 2 points on Gov. 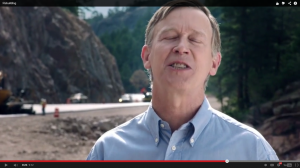 John Hickenlooper, 49%-47%. This is a marked contrast from earlier this month when Hick was up by 4 points on Beauprez (50%-46%). And, when we look beyond the toplines, it doesn’t get any better for Hick. Beauprez is up by 7 points with those who have already cast their ballots (51%-44%), just like having money in the bank already. Even though Hick leads among those who haven’t cast a ballot (50%-46%), he has to worry about making sure those people get their ballots turned in. For any campaign, the closer you get to Election Day, the fewer things you have to worry about it or left to do, the better. The need for Hick and the Democratic Governor’s Association to take a page out of the Udall playbook (same playbook as most stripclubs, “all women, all the time.”) appears as the so-called “social issues” is the only policy area Hick outperforms Beauprez. Whereas, when it comes to more economic issues like Government spending and taxes, Coloradans trust Beauprez more. Hick’s wishy-washy ways on fracking have alienated the far left as fewer Democrats support Hick (84%), than Republicans support Beauprez (85%). This is really no surprise as Fractivists have threatened repeatedly to sit out the Gubernatorial race as a protest against how Hick has completely ignored them. The ambivalent attitude towards Hick is even more apparent when we look at those who answered “No” when asked if they were certain they would vote. This apathetic group breaks Hick’s way by nearly 40 points (56%-18%). Maybe if Hick had the courage to take any sort of stance instead of always trying to mealy-mouth his way out of every situation, people wouldn’t be so lackadaisical when it came time to actually vote for him. We can just imagine Hick supporters standing in the voting booth (or at their kitchen table), imitating his governing style when it comes time to vote for him: First, they take a drink from the Wynkoop beer they smuggled in, then they look real close at the ballot and declare to themselves they are going to vote for Hick. Yet, as they come close to marking their ballot, they suddenly pull their pen back and tell a “Teddy Story.” After that, they explain to themselves how if they squint really hard, perhaps they can just make the ovals for Beauprez and Hick come together so they can mark both. After that fails, they take another swig of beer (good thing they brought some extra bottles), and step out of the booth, declaring to everybody that they have setup a Blue Ribbon Commission who will help them determine who to vote for because they weren’t allowed to take a staffer with them into the booth to make a decision. While this method of voting is horrible for the “‘non-politician’ politician” Hick, it’s great for the “I heart me some Wynkoop” Hick.